A Catalanman in Dublin Town: Personal and professional experiences by a Spanish expat living and working in Ireland. 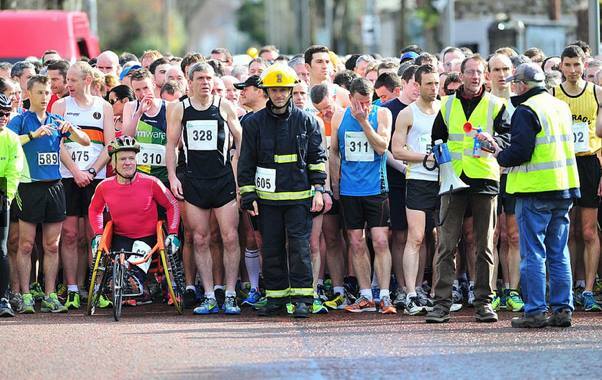 Half Marathon in Cork, ‘The True Capital of Ireland’? Last bank holiday weekend a few friends and I did a trip to Cork to run the #CorkCityMarathon. It had been more than one year since I had been in Cork and that was a perfect excuse to head to the Rebel County. At the same event there was a full marathon, a half marathon and relays. We went for the half, as it was our first time. The atmosphere was nice, it was not too crowded and you wouldn’t have the feeling that it was an ultracompetitive environment, as it was a rather small event compared to marathons organised in bigger cities. There was a good variety of people, nationalities and ages. There was even a fireman of the Cork brigade with the aim to break the marathon world record in the full official fireman outfit! You can see him in the picture below. Cork is the second city of Ireland and the county town of the biggest county in the island. It is a small and cosy city, especially compared to Dublin, a much bigger capital. Before moving to Dublin, I was used to hearing not precisely loving comments from Corkonians about Dubs. I thought that that would be a general attitude of other parts of Ireland towards the capital. However, once in Dublin, I was very surprised to learn that Corkonians were also regarded by the rest of the Irish as somehow arrogant or ‘special’. There are a few reasons for that: Corkonians are very proud to belong to the ‘Rebel County’. Their GAA teams are cheered with ‘Up the Rebels!’ and they consider themselves ‘The True Capital of Ireland’. Obviously, this rivalry, mainly between Cork and Dublin, is a healthy one as in any other normal country. However, I have to say that when I moved to Dublin I had my prejudices towards the people from ‘The Pale‘ after a few years of Corkonian nationalist propaganda. The video below is a promotional ad produced last summer by RTÉ for the GAA match between Dublin and Cork. It is a quite clever and funny way of showing the ‘clash of cultures’ between the two cities. But rather than to do a contrastive sociological or politologist study, the reason that brought us to Cork was to run a half marathon: our first half marathon. Although I hadn’t had the best preparation (I had recently been in a wedding in Spain for a few days, with the high doses of food and drink implied), we managed to finish it at a decent time. During the run, the people were very cheerful and helpful, there were a lot of water points and local neighbours gave us oranges and jellies. That was really helpful, especially in the last 5 km, when the muscles were becoming stiffer and stiffer and energies were fading away. We managed to finish and at a quite good time for being our first time. We of course celebrated with good Irish beef and a pint of Beamish stout, what else? As I was saying, Cork is a small but friendly city, and a good place to work or to study as there are multinationals (Amazon, Apple, McAffee, Dell, etc.) and an important university like University College Cork (UCC). The day before the race we went for a walk around UCC. When I lived in Clonakilty, I went every second Friday to UCC to the seminars organised by the Hispanics Department. After each seminar we had some red wine and Spanish cheese in the department. It was a good way to get to know the teachers and researchers there. In UCC you can learn Catalan, as there is a Catalan Studies lecturer and a Galician Studies Center. The campus is very nice, it has an old part ‘Harry Potter-wise’ and more modern facilities, like a museum of modern art in the campus. Afterwards, we had brunch in Triskel Arts Center. This is one of my favourite spots in Cork. It is an old church converted into a concerts, exhibitions and cinema venue. There is also a funky records shop upstairs and a nice cafeteria to have brunch, lunch or a beer while reading a book or chatting with friends. Unfortunately, I couldn’t show my friends The English Market, as it was closed on Sunday. Ironies of life, The English Market is the only indoors food market in Cork and probably in Ireland, as far as I know. They have very fresh products at a decent price. It would be very similar to any normal Spanish market, with fish stalls, meat stalls, fruit and vegetables, etc. We Spanish people would be very used to this kind of market, as we have one in each neighbourhood (more than 40 just in Barcelona city! – being the most popular for tourists La Boqueria in La Rambla), but in Ireland a market of this kind is a unique place and a tourist destination. For instance, when the Queen of England visited Ireland in 2011 (a hugely symbolic event, as she was the first British monarch to visit the country in 100 years!) she visited the English Market. After that, as semi-professional athletes that we are, we headed towards a pub to complete the last details of the training preparation: pints-lifting. We went to The Crane Lane, a must-visit pub with a concert venue. My friend Isaac, the only poet rugbyman in the village, joined us there. It was nice to see him as it had been more than a year since I had last seen him. That’s the problem with rugbymen poets, that they are all the time playing rugby or doing Poetry World Tours. Hopefully he leaves for a few days the True Capital of Ireland and pays us a visit in the Administrative Capital of Ireland. Afterwards, Noel the Galwegian, former team mate in Clonakilty pub running competitions, joined us to continue the pints-lifting session in a funky craft beers pub of the Northside (Southsiders of Dublin, don’t be scared, I’m talking about the Northside of Cork). Noel is exactly the opposite of Isaac: he really looks like a rugbyman and he even borrowed Gordon D’Arcy’s beard. However, the only rugby activity he does is running the wing to the bar at a frenetic rhythm. Around midnight we decided that our muscles were properly toned, we finished the last exercises and went to hit the leabah, also known as to go to bed. At 8 bells, I pulled the curtains to see that the light of the new day had come. We rose and shone, ate copious amounts of bananas, water, and some sugar, just in case. The moment had come and we, well, we… “We” were 5 going to Cork and “we” ended up just Sascha and I running the half. But in all fairness, like, to be honest, like, the rest hadn’t planned to run it. Vedran was more interested in taking pictures, deconstructing, constructing them again and uploading them in Google +, and Blagoj joined us for around half of the half marathon. Dimitri was sleeping. He got injured in the pints-lifting exercises. I wasn’t sure if I would be able to finish it. If one month before I was pretty confident that I would make it, as I had run a couple of times 15 km, the last month I had done a very poor to almost non-existing training. I hadn’t done anything the week before and I had been 10 days on holidays just running only twice and less than 8 km and eating a lot. From the beginning I could feel I wasn’t very fresh, but I knew that if I paced myself and reached the 10-11 km feeling more or less ok, I would trespass the psychological barrier and it would be then just a count down, as long as I didn’t speed up and kept myself properly hydrated. That’s more or less how it went: my muscles were very stiff and the last 5 km were quite hard, especially the last 2-3. The km/miles signs were very bad, as they were in miles (the official measures changed years ago to km), but sometimes in km, and in the last 2-3 km there weren’t signs saying if there was 1, 2 or 3 km left, so I didn’t know if I could speed up or not, and when I speeded up I realised I had to stopped as there was still 1 more km to go. Anyway, the important thing is that we crossed the finish line and walked a bit before sitting down. That was the moment where I felt very tired and disorientated, but after eating a few bananas and Oreos that the organisation provided, I felt better and we walked towards the hotel. Overall, it was a really good experience: it was nice to be back in Cork and to be able run and finish my first half marathon. I think that my next goal will be the #ClontarfHalfMarathon in 3 weeks and I am considering giving a try to the full #DublinMarathon the 27th of October. Anyone interested in joining me? PS. To finish I leave you this video of Rory Gallagher. Following the ‘clash of cultures’, if Dublin has Thin Lizzy, Cork has Rory Gallagher. Although he was born in Donegal, he was raised in Cork and lived all his life there. Someone told me that once a journalist asked Jimmy Hendrix how did it feel to be the best guitar player ever. He answered that he should ask that to Rory Gallagher. Drinking in Ireland, ah, drinking in Ireland. Irish have the reputation of being a nation of good drinkers, we have seen it in many movies and it is a stereotype. The question is: is that true? Yes. Categorically yes. Yes, they are good drinkers. Social life in Ireland, especially rural Ireland, has traditionally been organised around two institutions: the church and the pub. If you go to any place in Ireland with more than two houses and you don’t see at least one church and at least one pub, well, you are not in Ireland. Since Ireland is still a very rural country compared to other European countries, with a high population of people living in quite isolated areas, the only way they have to interact with other people is going to the pub on Saturdays and to mass on Sundays. As I said before, Irish people are very sociable and they love to talk: about the weather, about the new neighbour, about the new priest, about the government, about Ronan O’Gara, or about their cattle. And the pub is a welcoming neuralgic meeting point where all kind of different people can gather. The Pub in Ireland is an institution. There are loads of pubs, and all kind of pubs. Old school, modern, small, big, with live music, without, with TVs and sports, with a piano, with a cosy fireplace, with snooker and darts, with young people, with old people, or with old and young people altogether. I really like old school pubs, with old men drinking their stout at a very slow pace as if time didn’t go by, like characters of old movies like The Quiet Man or Ryan’s Daughter. A good thing about Irish pubs is the amount of live music for free that you can see. In Dublin you have live music every day in various pubs, and for free. And in the weekend, in every corner of the island, no matter if it’s a city, town or village, you’ll have a good choice of live music, traditional or rock/pop. However, (there is always some ‘howevers’), alcohol in Ireland is veeeeery expensive, and not only in pubs. An example: a bottle of red wine Sangre de Toro or white Vina Sol, which in Spain are around 4 € in a supermarket, in Ireland cost around 12-13 €, if you are lucky reduced to 9. A 50 cl can of beer in a supermarket won’t cost less than 2 €. And a pint of lager in a pub in Dublin won’t be less than 5 € up to 6 € or more depending on the pub. Stouts like Guinness or Beamish are slightly cheaper, but with the new budget alcohol raise, it’s difficult to pay less than 5 €. Dublin is more expensive than the rest of the country though, so just by travelling out of the city you may be able to find these same pints for up to 1 € less. In short, alcohol is expensive, but if you are not a marathonian alcoholic and just want to have a couple of drinks every now and then and enjoy some good live music, you don’t need to spend more money than you would be spending in Spain. And let’s not forget that a pint equals to 568 ml, which is more than half a litter. Afterwork drinks are quite popular in Ireland the same way as in other countries like England. It is common that any Thursday or Friday you find suited men and dressed up women having a pint once they finish work at their bank, office, hospital or school. Actually, drinking, and even getting drunk with workmates, is part of the Irish culture as long as you behave to certain extent (‘certain extent’ varies depending on the job, company, group or people). I’ve been realising throughout my 10 years living in Ireland and coming as a visitor that it’s more socially accepted drinking than not drinking. ‘That lad doesn’t drink? Mmmm, something’s wrong with your man’. Exagerating a bit, ‘never trust someone who doesn’t drink’. I love this motto. Did I ever tell you I love Irish people? Another thing that strikes tourists a bit is the poor variety of beers in a regular pub. People have the image of Ireland as a country of beer. However, this is not Belgium nor Czech Republic. If you go to any pub around the corner, the top lager will be Heineken, maybe Carlsberg, and you’ll have Guinness as stout, maybe Beamish, and Murphy’s too if you are in Cork. You could have Smithwicks ale and a couple more German or Belgian lagers too, but generally speaking, you won’t find an Irish lager. People thus mainly drink, at least in Dublin, Heineken (famous Irish lager from Holland) and Guinness. 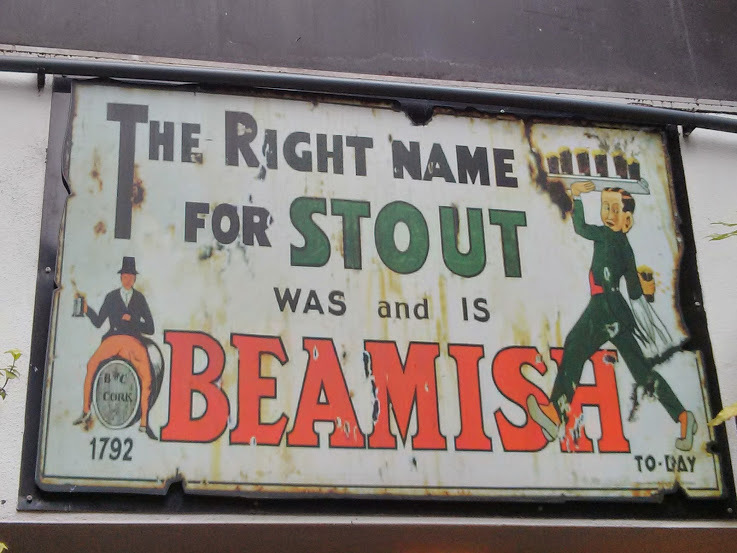 According to Gerry O’Hara, famous pub owner in Bandon, Co. Cork, the only 100 % Irish beer in his pub, O’Hara’s, was Beamish. All the products would be Irish, including the water. On the other hand, the only Irish thing in Guinness would be the water. All the rest would be imported from their plants in Africa and other locations. Interesting, right? (Thank you, Gerry, for your knowledge! Greetings to the people of Bandon). There’s much science about the brewing, especially the stout brewing. Guinness invests a lot of money in training pubs and bar tenders on how to brew Guinness properly. You may think that all Guinness taste the same everywhere, but the taste depends not only on how it is brewed but also on the distance between the taps and the barrels and other factors. So it really hurts me, not to say that it pisses me off, when you go to a pub in Dublin where they will charge you 5 or more euros for a Guinness and they pour it as it was Coca-Cola. No. No and no. Guinness, Beamish or Murphy’s are not Coca-Cola. They are not Heineken nor Carlsberg either. What a normal bar tender will do, or a normal bar tender that has ever drunk a stout will do, is to pour first less than half of the pint and leave it rest. After a few minutes s/he will pour the rest. Don’t get impatient if you are kept waiting for your dear beer. You MUST wait to have a proper stout. And a good stout feels good. Oh yes, it feels good. Especially on a cold rainy day next to the fireplace in your local pub. So if you like drinking, Ireland is a good place to be. Nobody will look at you with mistrust because you like to drink. You will be fully integrated when you embrace the drinking tradition, the proper nodding gestures as a way of greeting, the ‘How’s it goin’?’ or ‘What’s the craic?’, a ‘Good man yourself’ in the right moment, a ‘Fair play to you’ with a proper diction. That, a few freckles, and an acquired love for GAA and rugby, will make you the perfect newborn Irish person. Whelan’s: a must in Dublin. Concerts every single day, some for free, some with cover charge. Young and consolidated bands gigs. Any Irish band who is becoming known must have played there. Against the Grain: just across the street of Whelan’s. Crafted local and international beers. You won’t find Heineken, Carlsberg nor Guinness. A good choice of less known beers. Bernard Shaw: in Candem St. a more modern kind of pub. It’s a Berlin-wise bar with a two stories bus in the beergarden where you can have a choice of pizzas baked there. There’s a pool and in the summer a ping pong table. The Lower Deck: in Portobello Harbour, just next door of my previous apartment. This pub is in Dublin but reminds me of a country pub. Owned by Liam, a man from Tipperary, it’s decorated with hurling stuff. They made my Sundays more enjoyable when I heard a loud karaoke from my bed. International Bar: I like this place off Grafton St. because it’s an interesting mixture of authentic Irish pub with locals and some tourists. Live jazz or blues music almost every day. O’Donoghues: In Baggot St. I just went a few days ago to this pub. A classic with the reputation of having one of the best Guinness in town. It has an air of authentic old school pub . Slattery’s: My second home when I worked in Google. Just five minutes away, many Googlers and young professionals gather there for an afterwork pint or to watch rugby in the weekends. Just 5 minutes away from Aviva Stadium, so on match days it’s packed of locals or foreigners having a pre or post match beer. Smyth’s of Ranelagh: In the rugby ghetto too, where the beautiful people of beautiful Ranelagh go. It’s a nice pub and it’s good to go since it’s mainly Irish young people instead of a more international atmosphere of the center. McSorley’s: After Smyth’s, the beautiful people of beautiful Ranelagh go to McSorley’s for another pint and a dance. Interesting too. The Roundy: I like this pub because it made me feel a bit like at home, in Barcelona. It has a small terrace where you can sit while watching passers-bye in Cork center. The Crane Lane: Great venue for free concerts, it is quite big and either you can sit and have a quite pint or enjoy one of their good concerts. 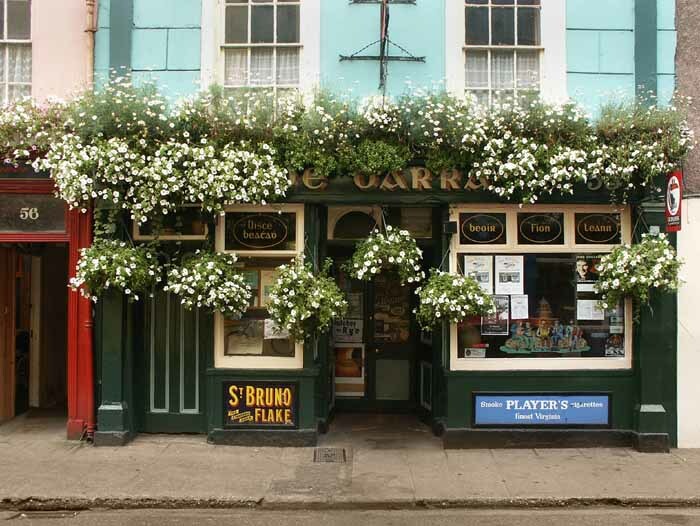 O’Hara’s: The Gateaway of West Cork, an institution in Bandon. Apparently a quiet and regular pub, Gerry O’Hara is a well of wisdom. He seems reserved at first, but he will introduce you to the locals and the not so locals, like the weekly foreign au pair gathering that he holds in his pub. With two tables of snooker and one of pool, don’t expect him to serve you after the sacred last call, but he might drive you home if he thinks you shouldn’t take the car. Debarra’s: This is my favourite pub in Ireland. I’ll never stop saying it. Second home for many years for Noel Redding, bass player of The Jimi Hendrix Experience, it holds live music almost every day of the week in 2,000 inhabitants Clonakilty. Trad music and rock concerts, destination of Limerick hen parties on Fridays and Saturdays, a perfect place for a Catalanman in West Cork. Scannell’s; Another good pub in Clonakilty, especially in the summer, as it has a great outdoors beergarden where barbecues are organised. Rugby, Poetry and West Cork: why this title? For those who have been in Clonakilty, Skibbereen, Inchydoney beach, Schull, Baltimore or Cape Clear, just to name a few places, you know already that they are really, really inspirational places. Inspirational to play hurling, football, rugby, or inspirational to paint, sing of write poetry, as my friend Isaac Xubin does. Isaac is a rugbyman, poet and West Corkonian in heart, all at the same time. We shared good moments together around 2 years ago when I was living in Co. Cork. West Cork is a place with many musicians, painters and all kind of artists who are looking for beautiful and quiet landscapes to relax and get inspiration. On the other hand, rugby and poetry may be considered by many as opposite poles. However, anyone who follows both things can see a relation, and Isaac is the tangible living proof of such connection. Rugby is a quite military sport indeed. There are more rules than in soccer, and the tactics and strategy are more organised and rigid. Many players even confess they don’t know all the rules. Simplifying, although there are big skilled stars in rugby the same way as there are in soccer, I wouln’t imagine a Lionel Messi or Maradona in rugby. Rather a Cristiano Ronaldo (The General according to Joseph Blatter), or a Frank Bekembauer. However, rugby is an epic and beautiful game. Rugby is a brutal sport where you can break every bone that you could break, but at the same time illegal violence and cheating are strongly punished. It promotes noble and fair principles, as of accepting defeat but respecting the rival when celebrating tries or winning. Even the famous Haka is somehow an anthem, dance or cry: a poetical expression in the end. Rugby is therefore a Romantic sport where individual ambitions meet group goals. Isaac was one of the first friends I made in Ireland. When I was living in Clonakilty, I attended the seminars organised by UCC Hispanic Department for professors and PhD candidates, and he was a Galician language lecturer there. We connected soon, as I had just started my rugby experience with Bandon Rugby Football Club. Isaac was a much more experienced player, since he had been playing for many years in Galicia. 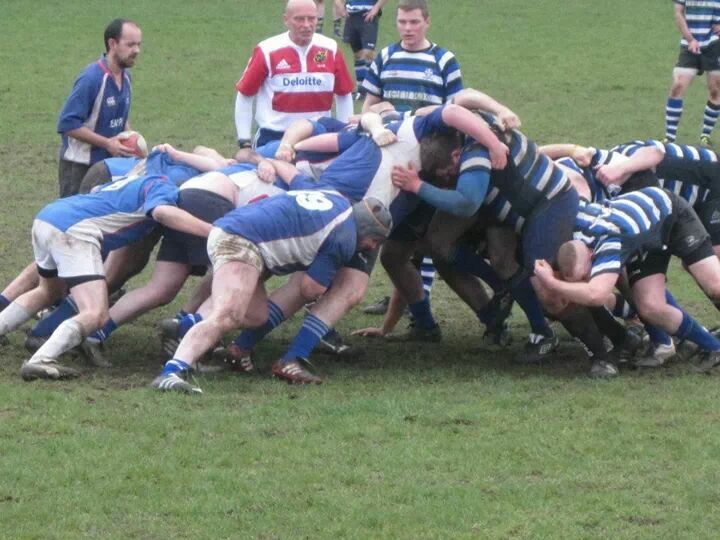 I had started to play at Bandon RFC thirds, and that was my first rugby experience. I knew that you had to pass the ball backwards and little more. Training was on Friday, and Isaac joined a couple of times. We played a few matches together on Saturdays and Sundays. While I was just given the last 15 minutes of each game due to my lack of experience, Isaac soon impressed the coach, Aidan, and played from the start as a scrum half under the name of a South African player that had left the team in order to be ‘legal’ and be covered by the club insurance. I was a winger, the best position for a newcomer, as you touch the ball just a few times during the match and, basically, what you have to do when you have it is run, run, run. I always had interest on rugby, but in Spain it is not very popular, or at least as a professional sport. It’s difficult to get to watch a live match on TV unless you go to an Irish pub. Since my days in West Cork, though, I watch it as much as I can Munster, Leinster, Conacht or Ulster matches, and I have been a few times at Aviva Stadium or RDS, even a 6 Nations Ireland-England! Also, during my time working at Google, I tried to join a team, but during my second training I badly broke my finger and I have two permanent screws and a stitch. I would have liked to continue, but rugby is a sport which is better to learn at the earliest possible stage, like cycling or driving. Not knowing how to play it properly is quite risky, so if you work with your hands, or with your legs, and you are a starter, I would think about it twice. For the time being, I will continue watching it on TV and following Isaac’s rugby blog. If you follow his stories, you will understand how Rugby, Poetry and West Cork are words that share a story, a space, a color, and a rhythm, and if not always that story has happy endings, there are beautiful things one can learn from being in West Cork, playing rugby, and writing poetry. Isaac’s blog, ‘Melé a cinco‘ -‘scrum at five’-, is written in Galician, but it can be automatically translated if you use Google Chrome and you click the option ‘Translate page’. Many people from all over the world come to Ireland for tourism, to learn English or to try to make a living working in Ireland. There are many things to say about how to survive in this competitive world: in this post, I will give you some tips that hopefully will help you to integrate and get a job in Ireland, if you decide to move here. Have you considered working in Ireland? First of all, as I said, having a good or very good command of English is essential to succeed here. There are many immigrants, from other countries and from yours, who will be as qualified as you are or more, as multilingual as you or more, as young as you or younger, as beautiful as you or more. So English is just the least skill you should have. That said, it doesn’t mean you should refrain from coming if you are willing to learn quickly. I have met many Spanish au pairs who had a BA degree, bud hadn’t a good level of English. However, after a few months with Irish families, they improved a lot, and some of them took courses or masters that allowed them to find more qualified jobs afterwards. Thus, an interesting option to consider as a bridge to get a full time position is coming as an au pair: an Irish family will host you, feed you and you’ll have some pocket money to do your things. And most importantly, you’ll learn English with them, you’ll build a network of contacts and you’ll have a platform to jump into the job market. Another option is to try to find a job as a waiter or similar professions while trying to study English or pursuing further education. I think it’s very important to come with a plan, even if it’s a two week intense course instead of just coming with some savings with the intention of looking for a job. This is an option too, but you might end up burning your savings with a flight back home. Another interesting way to go abroad is the EU Leonardo Da Vinci programme. I have met a few people that came to Ireland through Leonardo for 3-4 months, which included two weeks of English classes, lodgement, work placement, and a small weekly allowance. Some of them found a job afterwards or their contract was extended. Once the plan is designed and the decision made, the first thing to do once you touch down in Ireland is to find a place to live. Ireland is expensive, especially compared to southern countries like Portugal, Spain, Italy or even France. And within Ireland, Dublin is very expensive. If you don’t have a clear plan of action, I would recommend to avoid Dublin and go to smaller cities or towns with good communication with Dublin, Cork, Galway, etc. A room in a shared apartment in Dublin may cost easily 600-700 €/month, being that a normal price. That means that you can pay even more depending on the area. It won’t be easy to find anything cheaper than that unless you live far away or you share with many people. I have seen ads of 2 room apartments for 3,000 € /month (check daft.ie if you can cope with strong sensations). On the contrary, going to Cork, which is a way smaller city but cosy and with many multinationals like Amazon or Apple, may save you around 200 € per month o more. Even more if you are in a town outside Cork or smaller cities. The second important thing to do in order to be able to open a bank account or get any kind of social benefit is to get your PPS number (ID/Social Security number). To get it, you will need a proof of address: a bill with your name and address, your house lease, if you have it, or a letter from your landlord stating that you are living in that address. This is quite easy and it should be easy to get a PPS number. This is the first and most important thing you would need to do after getting a place to stay. It will open the doors of the administrative labyrinths to you. Once you have your PPS number, you can go to FÁS offices and register. There (or online) you can get information about courses provided by the Government, and you can search for job vacancies too. There is also the Springboard program, which sponsors certificates, diplomas and masters in public and private universities if you are unemployed. ICT Skills is a similar programme to Springboard, but people working can do these courses for free too. On the other hand, the most visited website for jobseeking is Indeed. You can also browse jobs at jobs.ie, irishjobs.ie and many others. I guess these are the first good tips to begin with. From here, the world is yours! It won’t be an easy start, but don’t despair: stay active and try to build a good network of friends and contacts. You never know who could offer you a job. If you are interested in sports, Ireland is a great place: GAA, football, rugby and many others. Socialising is a good way of making new contacts. There are very interesting Meetup groups where you will not only meet nice people but also learn a lot. You may spend weeks without work or with a job you don’t like, but if you stay strong with the idea of learning, training and willing to succeed, I think Ireland is a country where one can have good opportunities, especially in the IT sector. Keep fighting and good luck! I love Ireland. I say it all all the time and I think it all the time. I think it when I go to West Cork, Kerry, Mayo or Louth and I see amazing landscapes. I think it when I watch a hurling or rugby match in Croke Park, RDS or in a pub, I thought it when I played with my football in Inchydoney beach, and I think it when I am invited to have dinner with an Irish family. Sometimes I am afraid of insisting too much about how much I love Ireland because I wouldn’t like it to become the Salou or Marbella of the British Isles. Ireland has the good things of being a small country, like a strong feeling of community, and the good things of being a modern and quite prosperous country, as it is the base of the EMEA headquarters of the big companies. The landscapes I have seen, especially in rural Ireland, are some of the most beautiful sceneries I have ever seen. There are small villages and towns in places like Kerry, Cork, Galway, Mayo or Donegal where it seems as if time had stopped 60 years ago. And this is, for me, an important factor of the Irish charm in today’s 3.0 times. If you go to a shop in, let’s say Clonakilty, Co. Cork, the lady in the counter will most probably make some comment about the weather like ‘Yera, it’s been a miiiiserable week, but sure it’ll be grand anyway!’, although she has never seen you before. Irish people like to talk, and Irish people are nice in general. They remind me a bit of Andalusians. They like to talk, they like to take it easy. And yes, they like to drink. Éire is not only what we saw in The Snapper or Angela’s Ashes. It is a very modern country too. Much more modern than Spain or Italy in many things. It is strategically located between the UK and the US, it is a part of the British Isles but it is more integrated in the EU. It has obvious historical and political links with Britain and also with the US. Because of that, and because the famous low tax corporation, most of the IT giants have their headquarters here, mainly in Dublin and Cork: Amazon, Google, Facebook, Yahoo, LinkedIn, Twitter, Microsoft, and many more. But ‘no todo es oro lo que reluce’, as we say in Spanish, something as ‘not everything that shines is gold’. If the country hasn’t become yet a Dubai, Costa del Sol or Bahamas, it is probably for one important reason: The Weather. Yes, the weather is c***. Yes, it’s very bad. That joke ‘I love summer in Ireland, it’s my favourite day of the year’ is almost true. Weather is unpredictable. It may be sunny at 9, raining at 9:30, dry at 9:45 and frosting at 10. And that can happen anytime during all year except for 3 or 4 months, which doesn’t mean that there will be good weather in 3 or 4 months. It just means that it probably won’t frost during 3 months. This is the reason why I have been for two and a half years here and have no plans of going back to Barcelona. People seem not to believe me, especially coming from such a cool city. But I insist: I love Ireland, and as long as they don’t kick me out and I am happy here, here will I be. That Was All (Summer), Folks!